As part of my fantasy football research last offseason, I spent a great deal of time looking at a number of wide receivers with especially interesting cornerback splits (by strength of opposing cornerback, by 40-yard-dash time of opposing cornerback, by height or weight of opposing cornerback, etc.) in an effort to find some actionable intel for the upcoming DFS season. After a year of reflection, I’m not sure how sticky, predictive, or actionable these splits actually are or were. I do think they are useful, but maybe only for breaking ties in DFS. I’ll be deferring back to this article often during the DFS season, but I’m not placing a ton of weight into these splits. In fantasy football we always need to be cautious of small-sample bias. For instance, Odell Beckham Jr. averages 16.4 fantasy points per game in even-numbered weeks and only 12.6 fantasy points per game in odd-numbered weeks. Although this differential is rather large, as far as fantasy splits go, this information is not useful at all — there’s nothing to explain why these splits occurred. However, if these were home/away splits instead, you might see a different fantasy analyst reference these stats every week, even though the most likely culprit is variance. With this caveat in mind, here are the cornerback splits I found to be most compelling heading into the 2018 fantasy football season. Brown had easily the toughest cornerback schedule among all wide receivers last year. He ran 53.0 percent of his routes and had 41.4 percent of his targets against top-30-graded cornerbacks. Both rates led the position and, after DeVante Parker (who we wrote about here), it wasn’t close. Despite the clear disadvantage, it didn’t matter much for fantasy. Last year, Brown led all wide receivers in fantasy points per game (22.0), and for the third consecutive season. It also hasn’t mattered much for Brown throughout the rest of his career. Over the past decade, he ranks fourth of 66 qualifying wide receivers in fantasy points per target when facing off against top-25-graded cornerbacks (in any individual season). Throughout his career, Brown averages 1.91 fantasy points per target against top-25-graded cornerbacks. This isn’t far off his career average against all cornerbacks (1.94) and is well above the league-average rate for all wide receivers last year (1.70). Brown represents a rare instance of a wide receiver being wholly immune to cornerback play. Regardless of his individual matchup in any game, I’d continue starting him with confidence. If his cornerback matchup results in a reduced DFS salary or projected ownership (which we offer as part of our Elite subscription), he’d be a worthy contrarian play. As a bonus stat, Odell Beckham Jr. didn’t qualify for the above chart, but if he had he would have ranked first, averaging a whopping 2.17 fantasy points per target against top-25-graded cornerbacks throughout his career (on 188 such targets). Bryant was a colossal fantasy bust last year, finishing the season 30th among wide receivers in fantasy points per game despite ranking ninth at the position by ADP. I was low on him heading into last season due to an especially tough cornerback schedule and some glaring cornerback splits. After updating my charts to account for the 2018 season, his splits don’t look any better. Over the past four seasons, no wide receiver has been more cornerback-sensitive than Bryant. Over this span, he averages just 0.15 fantasy points per route run when lined up against cornerbacks who graded out as “elite” (grade of 90.0 or higher) in a given season. However, he especially beat up on cornerbacks who graded out “poor” (grade of 0.60 or lower) over this span, averaging a whopping 0.70 fantasy points per route run. His differential led all wide receivers over this span and perhaps this has played a role in his non-existent market this offseason. Interestingly, Brandin Cooks ranked second on this chart, and we’ve spent some time detailing his strange cornerback splits in the past (here). For Cooks and the other wide receivers on this chart, it’s worth keeping these splits in mind for DFS. For instance, I’d be less inclined to roster Demaryius Thomas in tough cornerback matchups (and may instead lean toward Emmanuel Sanders). In softer matchups, given his high-efficiency numbers, I’d be much more inclined to roster Thomas. Last season, I went in-depth on Brandin Cooks’ glaring cornerback splits when facing off against especially fast or slow cornerbacks. After one year in New England, his splits look less glaring, while Minnesota’s Diggs jumped to the top of our chart. In this exercise we’re defining a “fast” cornerback as one who ran a 4.44-second 40-yard dash or faster at their combine. All cornerbacks slower than this were deemed “slow.” All cornerbacks who did not run a 40-yard dash at their combine were excluded from our sample. Throughout his career, Diggs averages 1.55 fantasy points per target against “fast” cornerbacks (on 106 career targets), but 2.38 fantasy points per target against “slow” cornerbacks (on 109 career targets). Over the past decade, this differential (+0.83) ranked first by a wide margin, while the next-closest-player was Devery Henderson with a differential of only +0.56. Diggs ran a 4.46 40-yard dash at the combine in 2015. Henderson was a track star in college who ran a 4.37 40-yard dash at his Pro Day in 2004. Cooks still ranked top-12 this past decade, as did fellow speedster John Brown. I’m not sure how meaningful this stat is, but at the very least, it’s something to keep in mind for DFS this season. 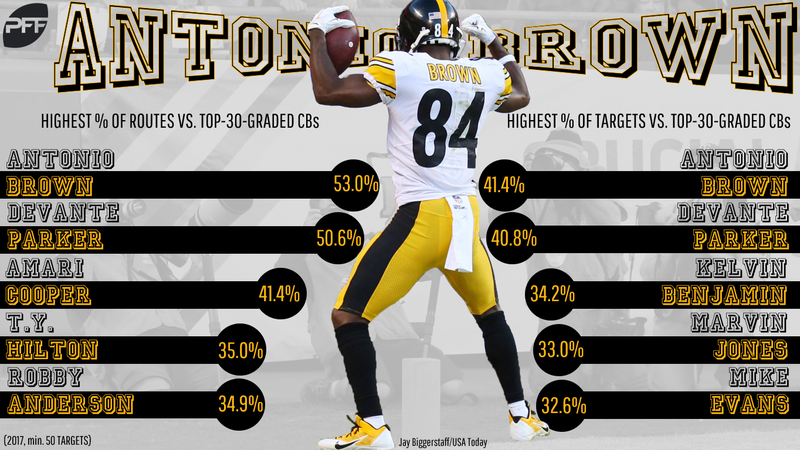 PFF subscribers have access to our weekly WR vs. CB Chart which will let you know which cornerbacks your wide receiver is going to face off against (and for what percentage of their routes) and how fast each cornerback is. This was not the only chart Diggs ranked highly in either. Like Bryant, Diggs appears fairly sensitive to the quality of cornerback he is facing. In our previous chart we looked at cornerbacks who graded out either “elite” or “poor.” In the following chart, we’re turning our focus on cornerbacks who graded out better or worse than average (grade between 70.0-79.9). Throughout his career, Diggs has averaged 0.39 more fantasy points per route run against “below-average” cornerbacks than he has against “above-average” cornerbacks. This is the largest negative differential of 174 qualifying wide receivers over the past four seasons. With Diggs, and all of the other wide receivers on this chart, I’ll be especially excited about their prospects for DFS when in soft cornerback matchups and will mostly be steering clear in tougher matchups. Whereas Diggs may have benefited from a significant speed advantage against certain cornerbacks, I wanted to see which wide receivers made the most of a height or weight advantage against opposing cornerbacks. On 130 career targets, Martavis Bryant averages 2.37 fantasy points per target against cornerbacks he is at least four inches taller than. On targets where there was less than a positive four-inch height differential (87 career targets), Bryant averages 1.44 fantasy points per target. This is the largest differential from any wide receiver, with at least 50 such targets in both instances, this past decade. Similarly, Robinson has benefited from a significant weight advantage throughout his career. On 155 career targets, Robinson averages 1.99 fantasy points per target against cornerbacks he had at least a 30-pound advantage on. On targets where there was less than a 30-pound advantage in Robinson’s favor (162 career targets), he averaged only 1.52 fantasy points per target. This was also the largest differential of the past decade. I’m not sure how meaningful these stats are, but it is possible Bryant relies more on his height (6-5) to win against cornerbacks (likely in contested catch situations) than the average wide receiver and Robinson relies more on his weight (209 pounds) to box out cornerbacks with his frame.